Just in time for Christmas, I’ve had a paper accepted by the Journal of Cosmology and Astroparticle Physics. 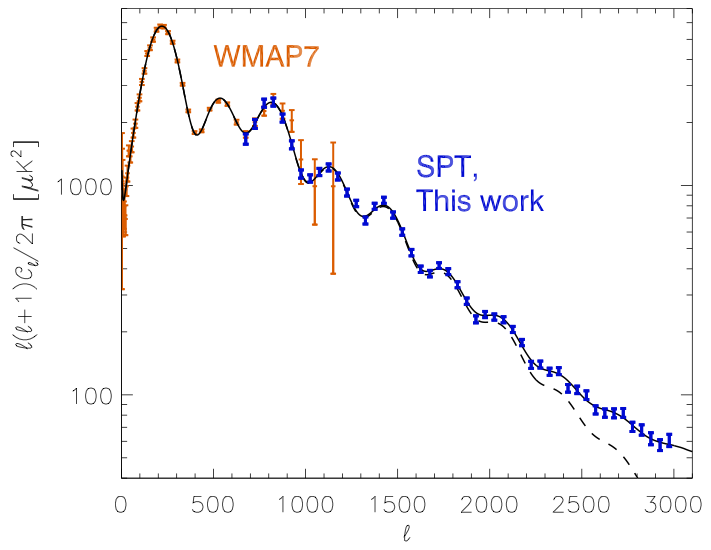 It’s called “Binding the Diproton in Stars: Anthropic Limits on the Strength of Gravity“. Here’s the short version. In 1971, Freeman Dyson discussed a seemingly fortunate fact about nuclear physics in our universe. Because two protons won’t stick to each other, when they collide inside stars, nothing much happens. Very rarely, however, in the course of the collision the weak nuclear force will turn a proton into a neutron, and the resulting deuterium nucleus (proton + neutron) is stable. These the star can combine into helium, releasing energy. If a super-villain boasted of a device that could bind the diproton (proton + proton) in the Sun, then we’d better listen. The Sun, subject to such a change in nuclear physics, would burn through the entirety of its fuel in about a second. Ouch. A very small change in the strength of the strong force or the masses of the fundamental particles would bind the diproton. This looks like an outstanding case of find-tuning for life: a very small change in the fundamental constants of nature would produce a decidedly life-destroying outcome. The following cartoon recently appeared on my Facebook feed, courtesy of Beatrice the Biologist. This provides a neat illustration of the difference between how a biologist approaches nature and how a physicist approaches nature. Here is perhaps the greatest astrophysicist of the twentieth century, Sir Arthur Stanley Eddington, in his book “The Internal Constitution of the Stars” (1926, pg. 16). We can imagine a physicist on a cloud-bound planet who has never heard tell of the stars calculating the ratio of radiation pressure to gas pressure for a series of globes of gas of various sizes, starting, say, with a globe of mass 10 gm., then 100 gm., 1000 gm., and so on, so that his nth globe contains 10n gm. Table 2 shows the more interesting part of his results. The rest of the table would consist mainly of long strings of 9’s and 0’s. Just for the particular range of mass about the 33rd to 35th globes the table becomes interesting, and then lapses back into 9’s and 0’s again. Regarded as a tussle between matter and aether (gas pressure and radiation pressure) the contest is overwhelmingly one-sided except between Nos. 33-35, where we may expect something interesting to happen. What “happens” is the stars. We draw aside the veil of cloud beneath which our physicist has been working and let him look up at the sky. There he will find a thousand million globes of gas nearly all of mass between his 33rd and 35th globes — that is to say, between 1/2 and 50 times the sun’s mass. The lightest known star is about 3 x 1032 gm. and the heaviest about 2 x 1035 gm. The majority are between 1033 and 1034 gm. 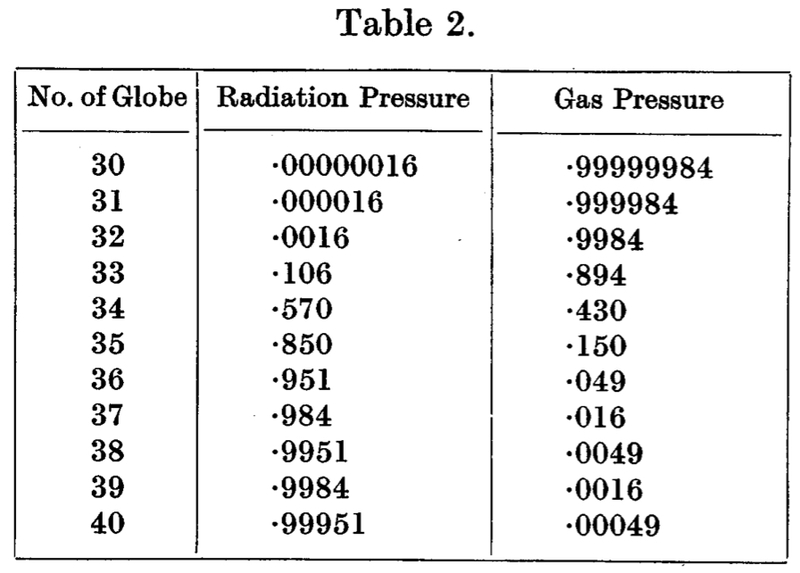 where the serious challenge of radiation pressure to compete with gas pressure is beginning. Having read a few good books on Aristotelian and scholastic (meta)physics (and, thanks to Scholastic Metaphysics: A Contemporary Introduction by Edward Feser, maybe starting to get a grip on what a formal cause is supposed to be), I’d had a few idle thoughts about what a mathematical formalisation of Aristotle’s physics would look like. Aristotle, and his colleagues in the Middle Ages, distinguished between pure mathematics, which studies abstractions, and natural philosophy, which tries to understand the physical world. The problem child for this scheme was astronomy, which studied the natural world and yet did so in terms mathematical, quantitative abstractions. Astronomy was thus categorised as a middle science. It was Descartes (as best I can tell) who first championed the audacious idea that all of physics could be as mathematical as astronomy. Newtonian mechanics gives us the first complete example of such a physical theory, mathematical from its very foundations. I show that Aristotelian physics is a correct and non-intuitive approximation of Newtonian physics in the suitable domain (motion in fluids), in the same technical sense in which Newton theory is an approximation of Einstein’s theory. Aristotelian physics lasted long not because it became dogma, but because it is a very good empirically grounded theory. Once the effect of the agent causing a violent motion is exhausted, the violent motion ceases. The natural motion of the Ether in the Heavens is circular around the centre. The natural motion of Earth, Water, Air and Fire is vertical, directed towards the natural place of the substance. Heavier objects fall faster: their natural motion downwards happens faster. The same object falls faster in a less dense medium. The shape of the body accounts for their moving faster or slower. In a vacuum with vanishing density a heavy body would fall with infinite velocity. From what has been said it is evident that void does not exist. Within this Newtonian model, we understand Aristotle’s principles as follows. Violent motion is when there is an external force. Natural motion is when there is no external force. Because of viscosity, the effect of violent motion decays away in a finite time. The motion of planets under gravity (buoyancy and viscosity being negligible), viewed from a rotating Earth, can be described using circular orbits. Remember that, within the observational limits of the ancient Greeks, Ptolemy’s model works! The terminal velocity of a buoyant body falling in a viscous fluid increases with its mass. Thus, ignoring the transient period of acceleration when gravity is dominant, heavy objects fall faster. The terminal velocity of an object (ignoring buoyancy) is inversely proportional to the (square root) of the density of the medium. The constant in the law in h) depends on the shape of the object. Somewhat surprisingly, this is a correct inference from the Newtonian model of Aristotle’s physics, in that as the density approaches zero, the terminal velocity approaches infinity. This doesn’t happen, of course, and identifies an unrealistic assumption: that the gravitational field is everywhere uniform. In reality, the falling object would eventually hit the mass originating the attraction. Following the conclusion of the model in j. ), and supposing that infinite velocities are impossible, one must conclude that the vacuum is a physical impossibility. This is an interesting lesson in extrapolating physical theories beyond their domain of validity. Aristotle’s physics is obviously not perfect – Rovelli lists all the important failings – but it does a very good job in the right regime, summarising the more complete physical model of Newton. A few of Rovelli’s conclusions are worth quoting. Here’s a few idle, Friday afternoon thoughts. I study distant galaxies. I use mathematical models of the laws of nature (and a supercomputer) to try to predict the properties of light emitted by and scattered through swirling vortices of matter, each containing a thousand trillion trillion trillion tons of stars, gas and dark matter, almost a trillion trillion kilometers away. My discipline – cosmology – has taken as its object of study the universe as a whole. And we’re doing pretty well, thanks for asking. I’d like to think that I am an evidence collecting, theory discovering, model investigating, equation solving (with a little help from my computer) machine. A parable. Suppose I call Toyota customer services. Me: Hi there. I own a 1993 Toyota Camry. I have a question. Toyota: Certainly, sir. Is the car running well, getting you from A to B in comfort? Me: Sure. It’s doing all that nicely. I was thinking about using it to drive to the moon. Toyota: … Right … Wouldn’t recommend that, Mr Barnes. No … uh … not really in the user manual, I’m afraid. Not what it’s made for. Suppose I find a customer support label on the back of my brain. Me: Hi there. I own and operate one of your brains. I have a question. Support: Certainly, sir. Is it operating your body, correctly? Are you getting enough food? Have you found a mate? Me: Sure. It’s doing all that nicely. I was thinking about using it to do theoretical physics, discover the fundamental laws of the universe and use them to understand the structure and evolution of the universe and all its contents. Support: … Right … Wouldn’t recommend that, Mr Barnes. No … uh … not really in the user manual, I’m afraid. Not what it’s made for. Let’s be clear about the point I’m making here. I don’t doubt that physicists in general and cosmologists in particular have discovered true facts about the universe. It’s just a tad amazing that we can do that sort of things with our brains. (We use computers and telescopes as well, of course, but they too are the products of human brains). To extend the analogy, it’s as if I find myself standing on the moon, wondering how I got there. And as I look around, all I can see is a 1993 Toyota Camry. It’s not that I doubt where I am; I’m wondering how I got here in that! I’m not asking: how do I know that our investigation of the universe is successful? I’m asking: why is our investigation of the universe successful? How does fighting/fleeing/feeding/reproducing machine manage to do theoretical physics? Perhaps the boring answer is the right one: we do it bit by bit. If we view science as extended and refined common sense, then maybe we can understand how a brain “made for” understanding local terrestrial environments is able to understand the universe. We don’t directly grasp the universe, of course. We rely on mental pictures and analogies. Mathematical models of the universe are perhaps analogies with equations. Having a mental picture of the world is useful. Just add curiosity and get practicing. It seems like the same problem arises for mathematics – how does a brain manage to investigate such abstract ideas as those of pure mathematics? The same answer suggests itself: abstract thinking is useful. Just add curiosity and get practicing. That the universe is rationally analysable at all, that there is order and reason waiting for us in the mathematical structure of the universe, is a remarkable fact. The intellectual problem we are presented with in nature is, in a very real and precise sense, solvable. It is one thing that the universe exemplifies such beautiful mathematics as Lagrangian dynamics; it is another, a fortiori, that the Lagrangians that describe our universe display numerous and deep symmetries. The universe is a complicated place, and the mathematics that describes it must be complicated at some level. The remarkable thing is that the complication is on top; there is simplicity underneath. To be more precise, the laws of nature are simple, their solutions can be complicated. Newton’s law of gravitation is simple, but for even three bodies, its solution cannot be written down analytically. In physics’s search for the ultimate laws of nature, many physicists wouldn’t accept a proposed fundamental theory unless it were simple, elegant, and beautiful. Paul Dirac went so far as to say that “it is more important to have beauty in one’s equations than to have them fit experiment”. It follows that physics cannot explain why the laws of nature are simple, elegant, and beautiful. Now there’s a thought for the weekend. Abstract: Christopher Hitchens stated that “At some point, we [the New Atheists] are all asked which is the best argument you come up against from the other side. I think every one of us picks the fine-tuning one as the most intriguing.” After introducing the fine-tuning of the universe for intelligent life, I will consider what it means for naturalism, the multiverse, and science’s quest for the ultimate laws of nature. Time: Saturday 30th of May 2015, 4pm. Last time, I started a review of the Carroll vs. Craig debate with a (mostly historical) overview of the back-and-forth about the beginning of the universe for the last 90 years of modern cosmology. Here, I’ll have a look at fine-tuning. I should start by saying how much I enjoyed the debate. They should do it again some time. In his speeches, Sean Carroll raised five points (transcript) against the fine-tuning of the universe for intelligent life as an argument for the existence of God. I want to have a look at those five. Carroll (here) and Craig (here, here and here) had a few points to make post-debate, too. First, I am by no means convinced that there is a fine-tuning problem and, again, Dr. Craig offered no evidence for it. It is certainly true that if you change the parameters of nature our local conditions that we observe around us would change by a lot. I grant that quickly. I do not grant therefore life could not exist. I will start granting that once someone tells me the conditions under which life can exist. What is the definition of life, for example? If it’s just information processing, thinking or something like that, there’s a huge panoply of possibilities. They sound very “science fiction-y” but then again you’re the one who is changing the parameters of the universe. The results are going to sound like they come from a science fiction novel. Sadly, we just don’t know whether life could exist if the conditions of our universe were very different because we only see the universe that we see. Is the debate over the definition of life a problem for fine-tuning? Sean and I had a brief discussion on this point during my talk at the UCSC Summer School on Philosophy of Cosmology. My response was (roughly) as follows. Consider chess. In particular, I’m wondering whether minor changes to the laws of chess would result in a similarly interesting game. Wait a minute, you say, you haven’t defined “interesting”. In fact, different people are going to come up with different definitions of interesting. So how can we know whether a game is interesting or not?